奇 ( jī | qí ) is a character that means strange but the glyph origin appears to have been lost. At least as far as I can tell after researching offline books, zhongwen.com, and zdict.net ( qí ). The character is composed of (dà) 大 and (kě) 可 but none of my references can explain why the meaning is "odd" (numerically) or "strange" (as in unusual). This is just one of the characters that seem to have lost it's history. I know that I could just accept it's meaning and memorise it but I really appreciate the storied history behind each character as a method to discern meaning. Can someone share information on the etymology of the character 奇? I am also interested in how I should deal with discrepancies between Chinese and Chinese-English dictionaries in general (see below for an example). Often, I note that the Chinese dictionary has more information (whose implications I am missing) than Chinese-English dictionaries (is there a better method than just using a source like www.zhongwen.com)? While researching this character I noticed that the Chinese dictionaries have much richer information available than the Chinese-English sources. Zhongwen.com hints that this may just be a person exhaling in wonder (to imply strange??) but is that a stretch? Zdict.net has a user forum (here) in which this character is discussed but I am afraid that I may have missed the gist of the conversation. So any help would be appreciated. The following reference image was shared in a post by user if that is any help. I am unsure of the original source and whether or not this is a composite. 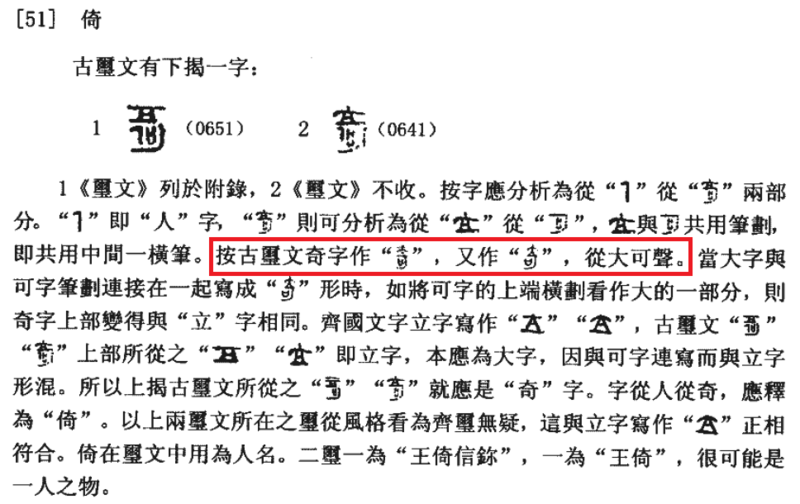 The discussion on zdict basically explains that the Oracle bone script morphed (讹变) into its current form, but this transformation did not follow standard rules. Karlgren’s Analytic Dictionary gives 踦 as meaning “one-legged, halt, lame; single.” In other words, “standing on one foot” is semantically linked to “strange, odd number,” and the character 奇 originally had both meanings. It’s also easy to see the “man with one leg” in 奇, if you are looking for ways to memorize this character. Taking a different tack, both Karlgren and some of the early dictionaries state that 可 is also a phonetic element, although the correspondence is inexact. So, in short, the character 奇 doesn't represent anything related to the meaning ‘unusual’. There are many cases of such phonetic loans. Consider 花. It means ‘flower’, that's why it has the grass radical. But it may also mean ‘to spend’. There is nothing in the components 花 that is related to the meaning ‘to spend’. The only relation is that the Mandarin word for ‘to spend’ is pronounced identically to the Mandarin word for ‘flower’, huā. If it came from「馬」, then there should be other examples of「可」morphing into「馬」. The structure of the character itself doesn't tell us too much about why it came to mean "strange". The Zhongwen.com explanation has over-interpreted the character as a compound ideogram. "A person exhaling in wonder" plausibly interprets「大」as a person and 「可」as "to exhale", and note that「可」is viewed by some paleographers as a very ancient and possibly original character of「歌」, "to sing". However, this compound ideogram theory lacks evidence, as if「奇」indeed depicts a person exhaling in wonder, there would be textual examples of「奇」being used as a verb meaning "to exhale (whether or not in wonder)". The best thing to do is to wait on more evidence to be gathered rather than subject the character to wild interpretations. All the literature citation is found here ：http://www.zdic.net/z/17/js/5947.htm. In fact, one is a special (odd/strange) number for most cultures when they start develop mathematics. For unknown reason, the early writer of I-ching successfully derive a binary multiplication from the number one. As we know today, any number power of 0, is 1 . And I-ching binary i.e. # guess what happens when zero power of zero ? Due to its special attributes, 1 is also known as 奇 , but only in I-ching. In modern mandarin, it is no longer mean one, but odd number. （update) I just found a reference of the ancient 奇 glyph. You have to take some of the old non-scientific etymology sources (like Shuowen) with a grain of salt sometimes, and certainly of forum sources. It's not credible to me, for example, that the 可 in 奇 could have been simplified from 馬. This is simply not possible. It's also not credible to me that 奇 derived its pronunciation from 可. So what is plausible? Absent an Oracle Bone character that matches 奇, we don't really have direct evidence for the origins of the Small Seal 奇. Everything is going to be a guess. However, the Oracle Bone character you provide here (if it indeed existed 1): 大 (man figure) + 丁 (some bar), but no 口 (mouth), would come close to being a plausible precursor. It turns out, a well placed 口 at this stage of character development was almost always a phonetic loan marker. So the Small Seal character 奇 is possibly a re-analysis of an (unattested) Oracle Bone character 奇 = (大 + 丁) + 口 that is a phonetic loan of whatever the Oracle Bone character 大 + 丁 is. Some say this comes from the "surprising" appearance of mounted cavalry, given that horses were a late import, but more likely it's just a homophone. etc. That the abstract meanings of "odd" (both "not paired" and "unusual") retained the non-radicalized 奇 is also consistent with common practice. 1 As another answer points out, this is a "fake" in that it did not come from a serious academic source. A source says it is found unattributed in the book 《汉字密码》 ("The secret code of Chinese characters") by the "alternative theory" author 唐汉. It's not clear if the entire character is made up, or it is simply given a made up semantic explanation. The answer assumes the character itself (or one substantially like it) is found somewhere in the Oracle Bone corpus, and proceeds from there. Not the answer you're looking for? Browse other questions tagged characters etymology glyph-origin or ask your own question. What is the origin of the proverbial phrase, “Drink the Northwestern winds”? Glyph origins: are explanations in such dictionaries authoritative or just later vague interpretations? What is the origin of the character “糬” seeminly only used in “麻糬” to translate a Japanese word which doesn't use either character?